Radio Advertising: Still Worth Considering? Many business owners and managers are always trying to gain market share. The primary way to increase both revenue and sales is advertising. Advertising is not just expensive, but immensely complicated as well. Which route does a business owner take? How much money should a business spend on advertising? Business owners are bombarded with many advertisement choices. One of the most common forms is TV advertising. Even though it's expensive, it still gets to the most viewers. TV advertising is typically designated to large corporations who have the available funds to invest in this form of advertising. During the 1950s and 1960s, TV and radio advertising were the two most efficient ways of getting commercials directly to the public. Almost every single household in America had either of these. Over the past decade, internet advertising opened up new opportunists for businesses. Internet advertising offered many businesses low or no cost advertising (Although, usually free advertising was and still is poor quality.) Many businesses used internet advertising to get their names out there, and according to online advertising companies the strategy has been extraordinarily successful. In the late 1990s and early 2000s, pay-for-service radio became popular and was eventually available to the public. These services offered customers little or no commercials while listening to their favorite stations. Some businesses believed that pay-for-service radio was the way of the future and invested large sums of money into these commercials. In the end, the results varied. According to many marketing experts, radio is still a very potent medium of advertising, especially with its new found resurrection and popularity. Though it is nowhere in competition with other forms of mass communication such as TV and the internet, it still has its own niche when it comes to communications media. Those who listen to radio are generally from the old generations. These individuals are loyal, they normally never give up listening to it. They will switch on the radio, automatically after waking up or after they get home from an activity. Hence, if you target these consumers directly through radio, your product or service has a fair chance to get heard. As all of us know that radio broadcasting is speedy and can reach large numbers of people, within a span of just a few minutes. To talk of another aspect, even coming up with a radio commercial is not a very time-consuming endeavor. It is much simpler than creating a TV or internet ad. This is a crucial aspect, particularly for a business to do well. Another important factor about radio advertisement is that general radio is free. Yes, some TV channels are free as well, but not cable TV. This day and age getting an internet connection is not free either. So, radio is one of the most accessible forms of communication still out there. Moreover, one of the major advantages of advertising on radio is that it is extremely cost-effective compared to TV and other forms of advertising (even some search engines). Some may argue that TV and the internet are easily accessible, but radio is also a truly mobile medium. In the car, at work, and at play, radio is always there. Today around 2/3 of newspapers dedicate their space to ads. TV spends about 1/3 of its time on advertising. What is radio's ad ratio vs. TV? Today’s radio, at about 10 minutes of advertising per hour, devotes less than 1/5 of its time to ads. According to some Psychologists, consumers need to be exposed to an advertising message at least three times before it begins to penetrate. Most small businesses cannot afford the necessary three- times-plus frequency that effective advertising demands. Fortunately, radio offers that. Many marketing experts feel that based on statistics alone, business owners should not count radio out as a viable advertising option. In the last month, one if five have listened to radio. Twenty percent of Americans over the age of twelve have listened to some form of radio in the last month. In the past month around 52 million people listened to radio, and that was just in the U.S. alone. Radio advertising used in conjunction with newspaper advertising increases brand recall almost three times more than newspaper advertising alone. When it's used in conjunction with internet marketing it raises the return on investment almost five times more than just using internet marketing only. Furthermore, radio has a 49% better R.O.I. (return on investment) than TV. Many would agree that TV and the internet are popular and may only be getting more popular over time. That still does not mean that a business owner should rule out radio as a form of efficient advertisement. 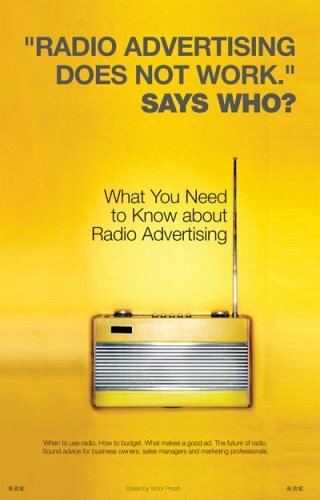 "Radio Advertising Does Not Work." Says Who? Radio still has a place in our lives and I can see the value in placing ads there. Rates are usually very competitive and in a metro market not only are the broadcast signals strong enough to blanket the city they reach outlying communities many miles away as well. Thus, even people who aren't approximated to the business advertised are STILL getting the message, even if they aren't the target audience. So, that "extra" coverage technically is free! Good piece, thumb. Thanks, I appreciate the positive feedback! Very interesting and thoughtful piece.